Two-pocket paper folders contain 75% post-consumer recycled material. Minimum purchase quantity is 100 units (one display). Two-pocket paper folders contain 75% post-consumer recycled material. Portfolios feature two business card slots. For 11 x 8 1/2 document storage. With prongs. Assorted colors include red, yellow, green, blue, purple, black, white. Minimum purchase quantity is 100 units (one display). Hi, I'm Griffin at C-Line. And today we're going to talk about our Recycled Two-Pocket Paper Portfolios with Prongs. These colorful folders conveniently store letter-sized documents and paperwork. They come in an assortment of primary colors and contain 75% post-consumer recycled material. The folders feature prongs, some people refer to them as brads, to lock in your three-hole punch papers. Simply flip the prongs up and insert your pages. Now, fold the other flap down so that the prongs are inserted through the holes. Finally, fold the prongs over to hold your pages securely in place. The folders have two large pockets and each pocket has a place for a business card. They also have a bit of a glossy finish which really allows the colors to stand out. 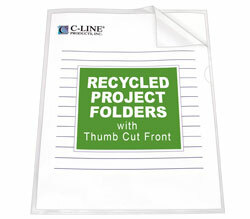 C-Line's Recycled Paper Portfolios with Prongs store presentations, reports, paperwork and more. They're great for your home, school, and business. Order yours now! That's all we have for today. I'm Griffin at C-Line. And thanks for watching.